Put ingredients in bowl. Mix until just blended. Spoon into greased mini muffin tins, or regular muffin tins lined with papers. Bake the mini muffins for about 10-12 minutes at 350 degrees, and the regular sized ones for about 20-22 minutes, or until done. Place on rack. 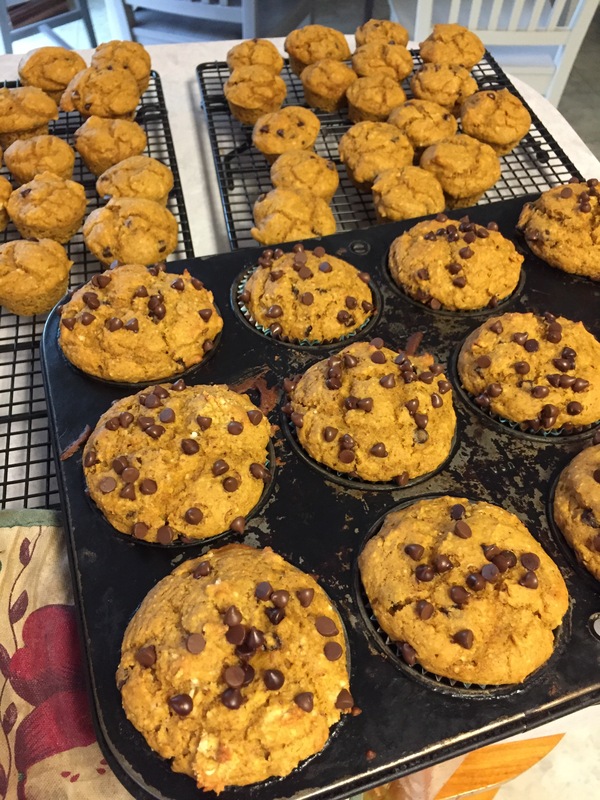 After cooling for 5 minute, remove muffins from pans and let them finish cooling on rack. They are very moist and it works best to just freeze any you are not going to consume within 1-2 days. 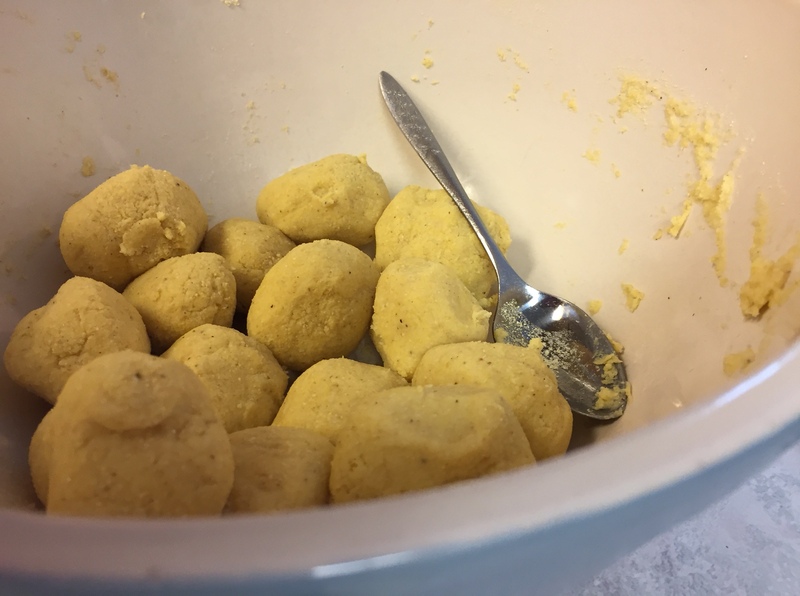 It’s very easy to remove a couple mini muffins from the freezer and let them thaw on the counter or in the microwave for a quick breakfast or to go with soup. A double batch made 36 mini muffins, and 12 regular muffins. I decorated the larger ones with additional mini chocolate chips, and will freeze those to take to a holiday meal, gathering, or for a time when I’m having company over. 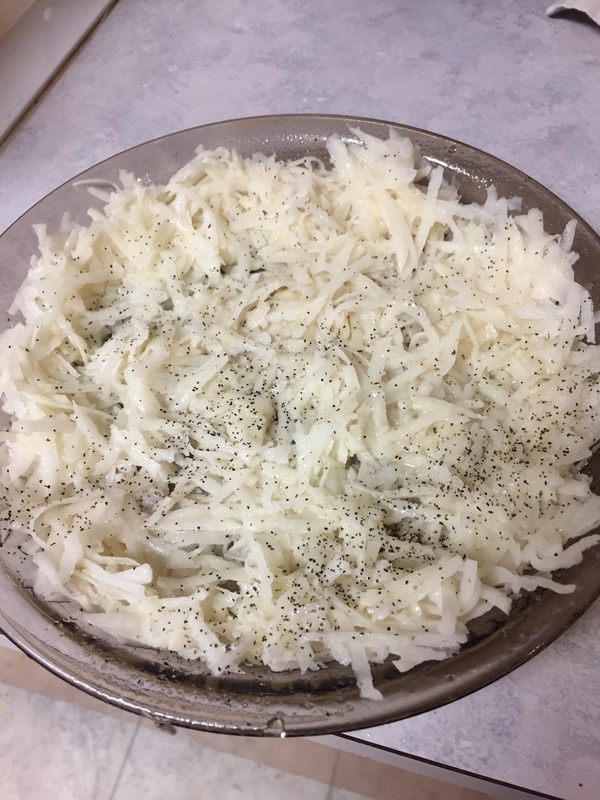 This egg pie has been a favorite of our family for years. I thought I’d make one this morning and share the recipe. 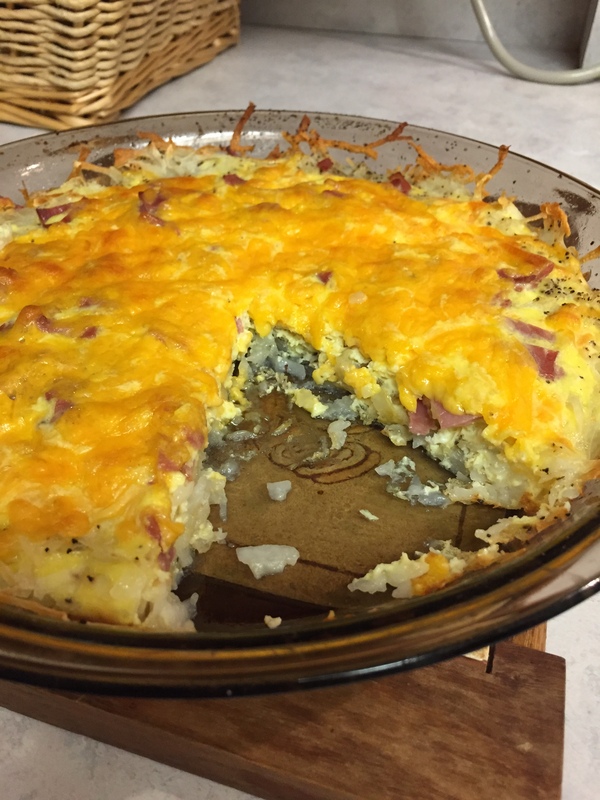 It is a perfect recipe to make for either breakfast or dinner and can be made ahead during the busy holiday season. While that was baking, I mixed 3 eggs, 1 teaspoon dried, minced onion, 1/4 cup 1/2 and 1/2 (milk works) and a little bit more salt and pepper (probably 1/4 teaspoon each). This is the filling. If you want more eggs, you can add in 2-3 more eggs without changing the basic recipe much, and there is room in the pie dish for them. I also got my toppings ready. 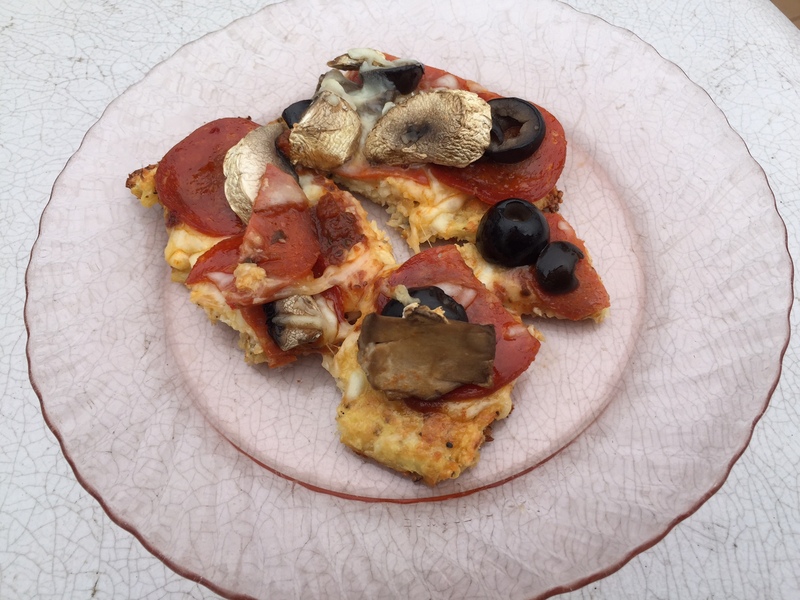 Toppings: Today, I used turkey ham bits (about 3 Tablespoons) and cheese(1/4-1/2 cup). In the past, I’ve used so many different things. 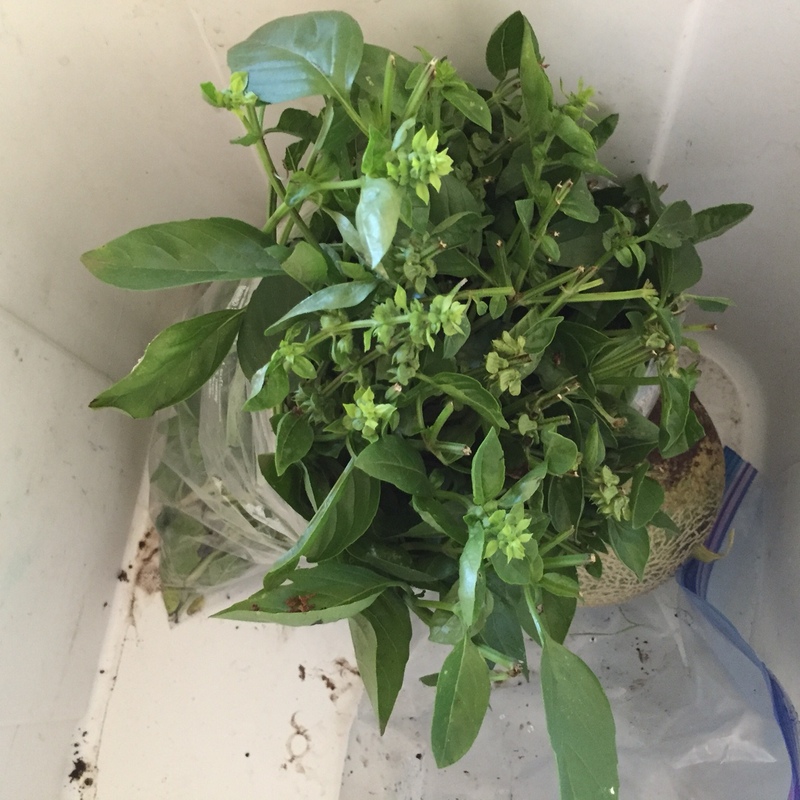 Here is a list of things I’ve used at times: cooked spinach, cooked Swiss chard, cooked broccoli bits, ham pieces, bacon bits, leftover taco meat, parmesan cheese, mozzarella cheese, any other cheese I had laying around—basically any leftover that I thought would taste good on there. 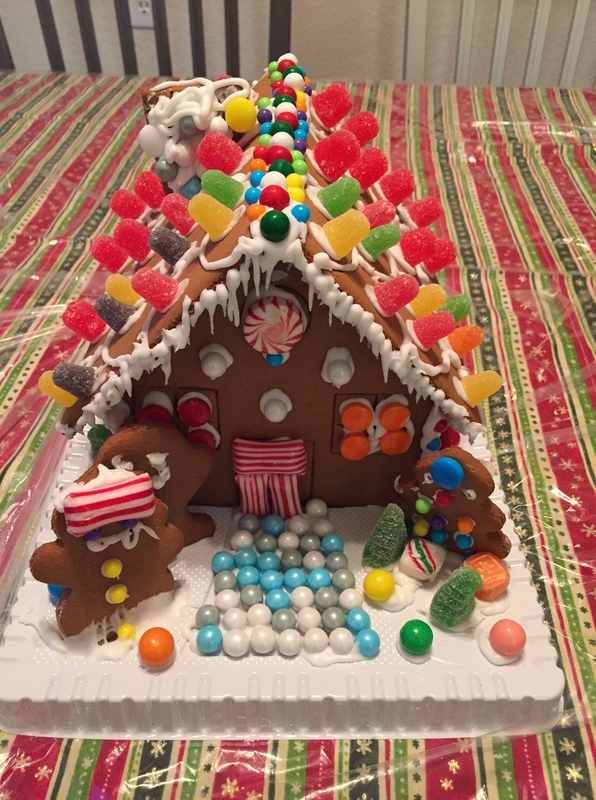 The key is to not put much of anything odd or strong-flavored on it, or the kids won’t eat it:). Small bits–no problem! 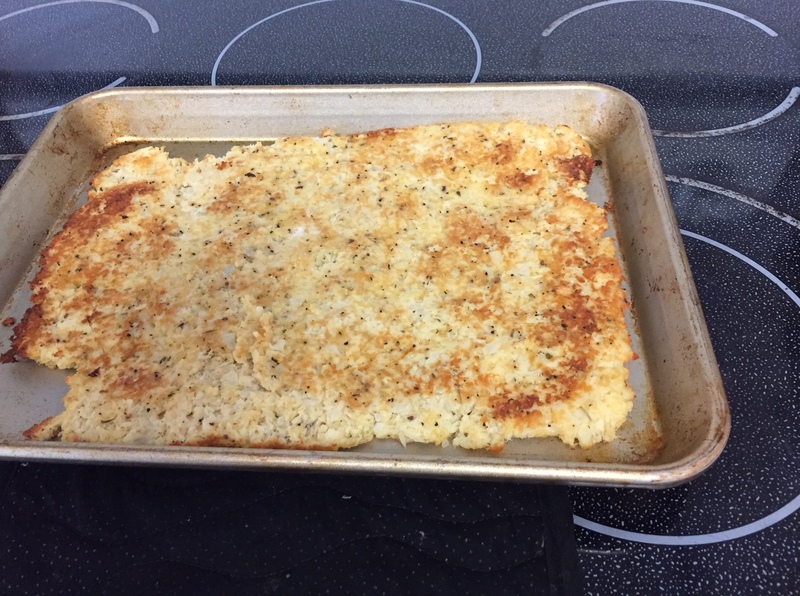 When I removed the crust from the oven, I poured the filling into the crust, and than added the toppings and popped it right back into the oven. I baked that for 15 additional minutes in the 400 degree oven. Then, we were ready for breakfast. If you have added more filling, or lots of cold leftovers, you may need to cook a bit longer, say 20 minutes. You want the filling to set. This pie serves around 6 and can be made ahead and reheated one slice at a time, as needed. 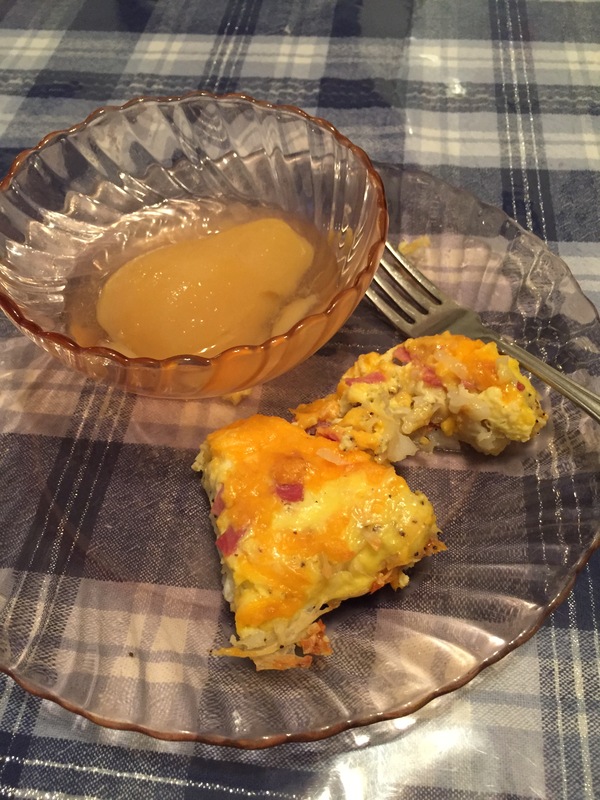 We enjoyed it with home-canned pears. It is tasty and economical, especially with egg prices as low as they are right now! I started with a recipe from Taste of Home, and have changed it up over the years. Here’s what I did today. This recipe is very flexible. Stir those ingredients together, and set aside. This is the sauce that gives the stir-fry a great flavor. Stir it one more time right before pouring it over the veggie/meat mixture. 1 bunch broccoli, cut into flowerets (it was 1 medium-sized bunch) I also cut the stem into small pieces and added that in. I put a small bit of oil into a frying pan and cooked the chicken and onion for about 4-5 minutes, until the chicken was looking almost done. Then, I added a little more liquid (some of the mix I made above, or plain broth. If you use the mix, take from the top so you don’t get any cornstarch at this point.) Then, I added the veggies in the order of hardest first, and softest (or anything that needed to stay crisper)last. 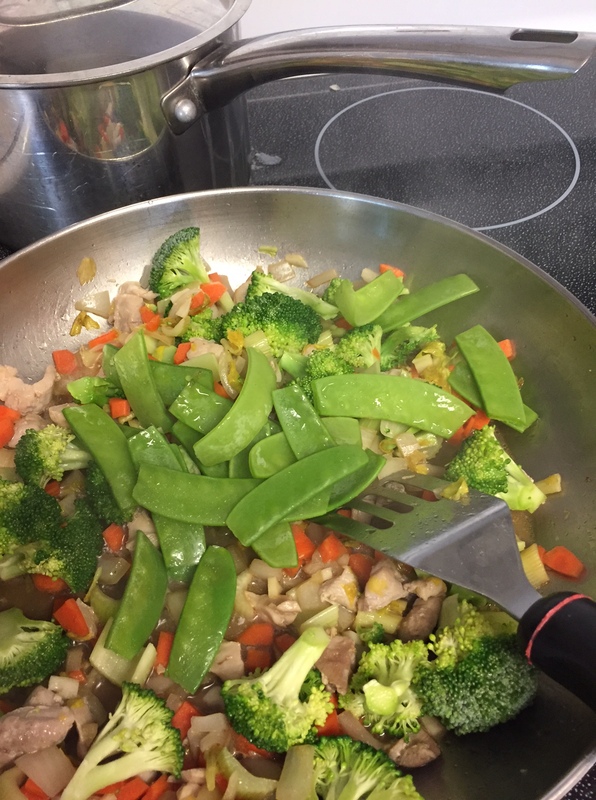 So, today I had carrots, celery, broccoli, mushrooms, snow peas and minced garlic. If you have a different assortment, it will work. Others I like in there are zucchini and summer squash, peas, and bean sprouts, to name a few. The sauce is very important and it gives any veggies that great flavor. I let it cook for a bit, stirring often. After the veggies were crisp, but getting tender, I poured in the mixture. I continued cooking and frequently stirring until the mixture thickened. I did not let the veggies get very soft, just crisp-tender, because that is how my family likes them. I made white rice to go with this, and it sopped up the marvelous sauce nicely. 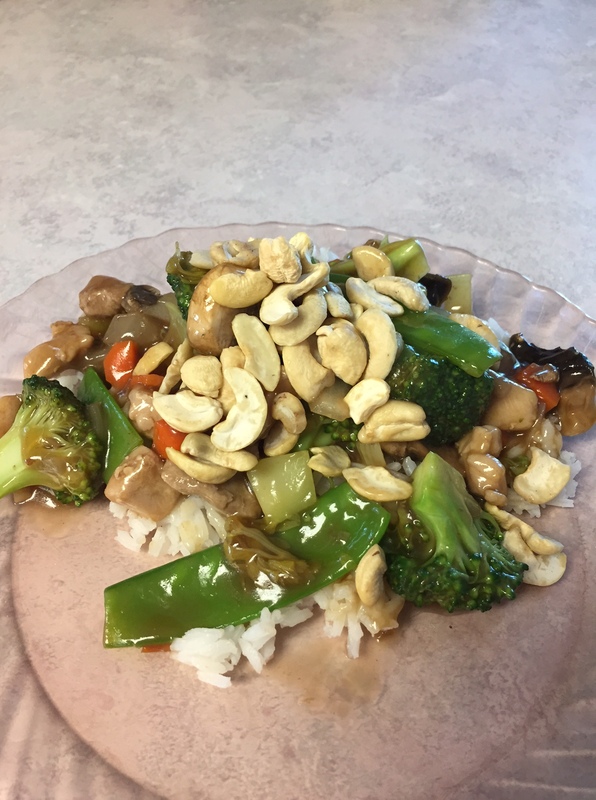 I sprinkled some cashews on top of each portion after it was plated. This would have been enough for 4 normal people, but 3 of us very hungry people ate it all. It would be easy to stretch this, by adding more veggies. It is tasty and healthy. Stir the dry ingredients together until mixed. Make a small well in the center of the dry ingredients. Beat the wet ingredients together and then pour them into the well in the center of the dry ingredients. Mix together. Put into 12 muffin cups that have been lined with cupcake wrappers or sprayed with non-stick spray. Bake in 350 degree oven for 16-20 minutes, until golden brown. Remove muffins from pans and place on a cooling wrack. 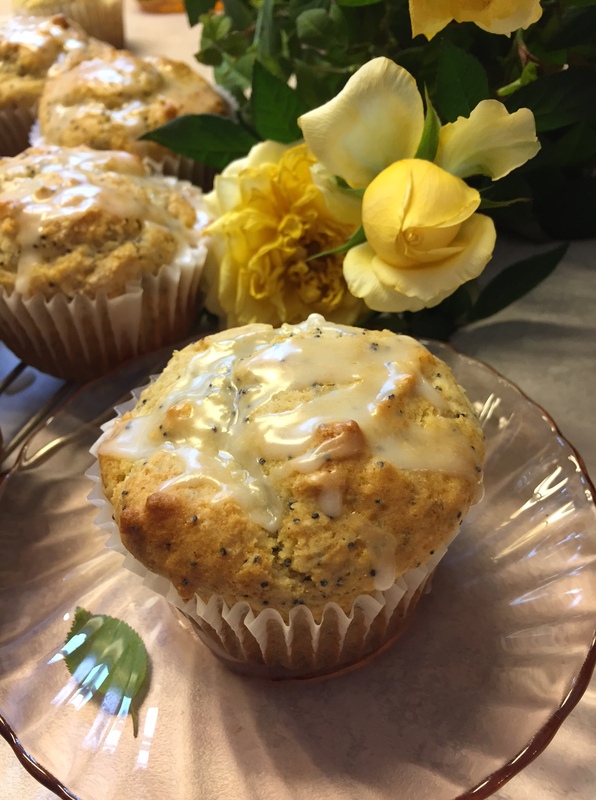 Make lemon glaze and drizzle on top of warm muffins if desired. We have eaten them many times without glaze. Let them continue to cool until completely cooled. 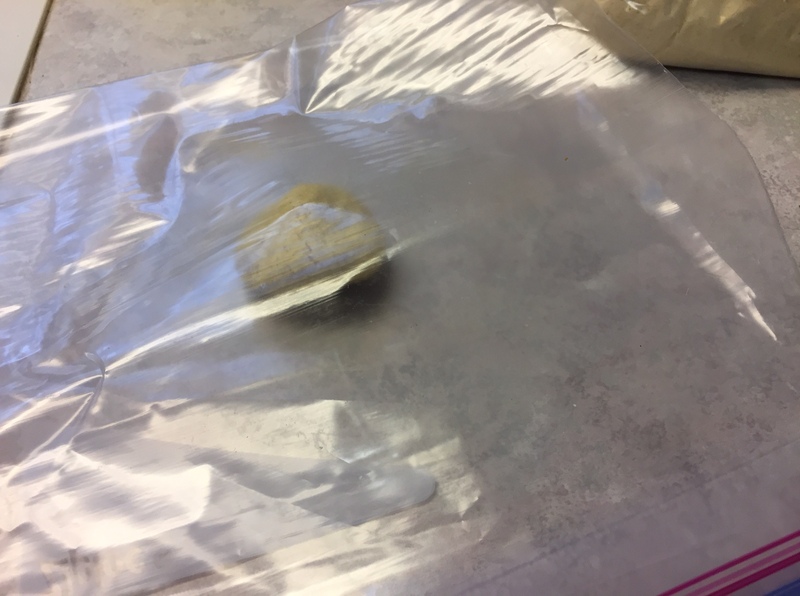 Freeze any muffins you are not going to use immediately, then remove from freezer, thaw on counter or in microwave, and enjoy. Makes 12 muffins. 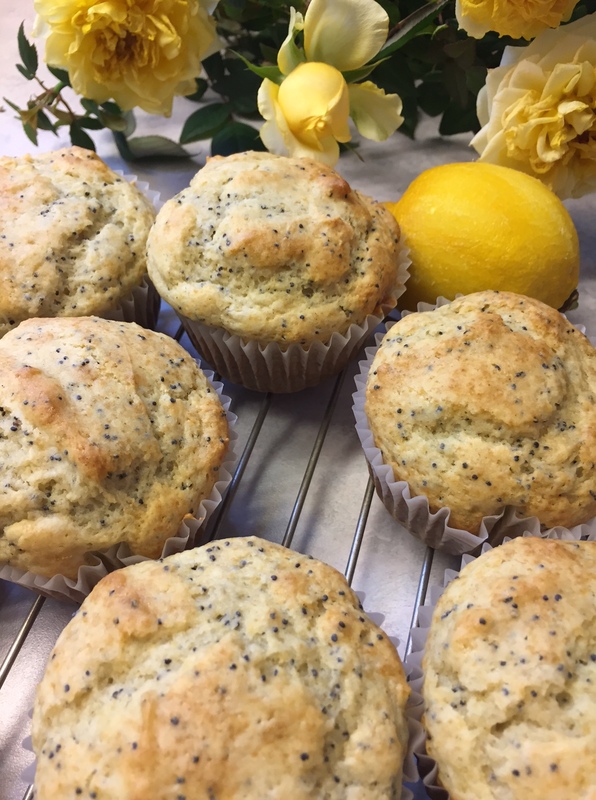 Stir powdered sugar and lemon juice together until the glaze is able to be drizzled on to the muffins. Start with a small amount of juice and add more until desired consistency is reached. If you put in too much juice and it is so runny and just slides off the muffins, add a little more powdered sugar until it thickens up slightly. If you have to spread it like frosting, it is too thick and you need to add more juice. 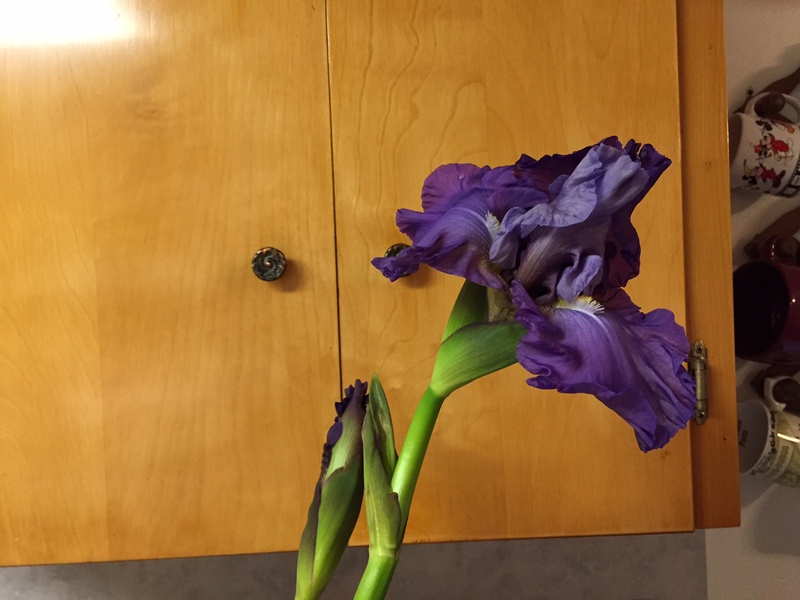 The weather turned colder, and so Rob picked the iris. It opened right up overnight. It’s so pretty and unusual to have an iris blooming in December! 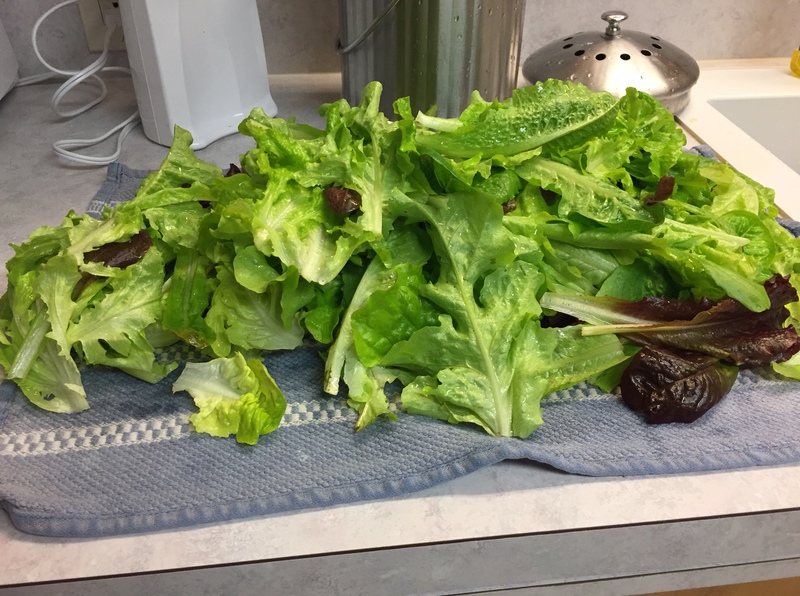 I also picked a tremendous amount of lettuce from the garden. I think it’s the last hurrah, but who knows? I was able to serve taco salad to our family and the friends who visited and still have lots left. 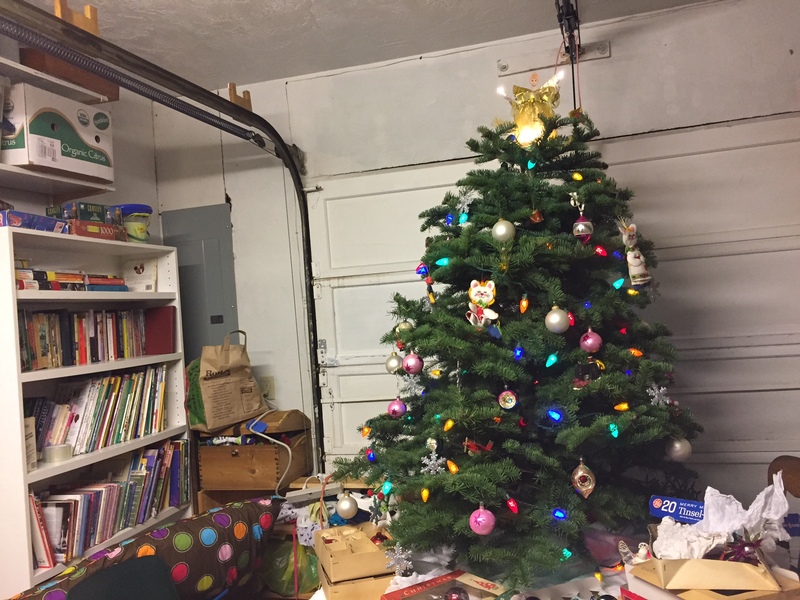 We put the tree up in the garage/family room. It is sitting on top of a table I keep out there. Rob got a bargain tree for $20 that he cut down on Saturday and chopped it off to fit the small area we have. We used the branches from the part he chopped off to decorate the railing in front of our house. He put up a small string of lights as well, outside. I dug through the bins of fabric in the shop and found a Christmas piece. I used it for a tablecloth to make the kitchen more festive. I bought a kit for a gingerbread house, plus a little more candy from the bulk section of Winco, and Patsy enjoyed decorating it for quite a while on Saturday. While shopping, I found chicken drumsticks for 68c/lb. I bought 3 packages, cooked 1 and froze 2. We have had spaghetti several times this week, from the batch of sauce I made last Tuesday. We will finish it today. 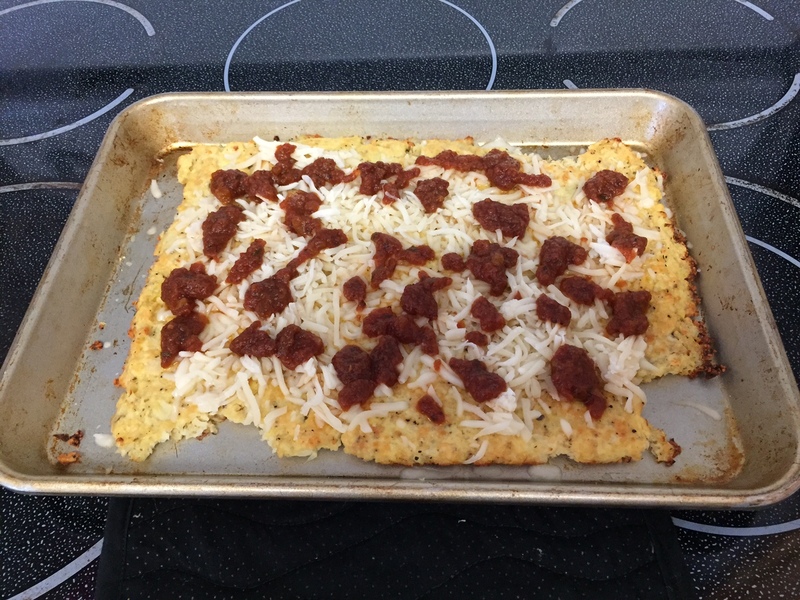 It was a large batch and was made from home-canned tomato products, 1 pound of ground beef and various odds and ends of parmesan cheese that were in the fridge, over gluten-free noodles I had on hand. We also had make-your-own tacos/taco salad with our friends. There are still quite a few leftovers in the fridge to keep the family eating for the first part of the week. I’m always looking for appetizing ways to use the food that I have stockpiled. There’s no point in having lots of food, just so it can get old on the shelves, and end up cooking with stale, outdated ingredients. Sometimes, when food is bought in bulk packages, it is much cheaper, but the purchaser ends up with more than they can use. Last spring, this happened to my mother. She bought a large package of quick-cooking tapioca and gave me a baggie of the excess. 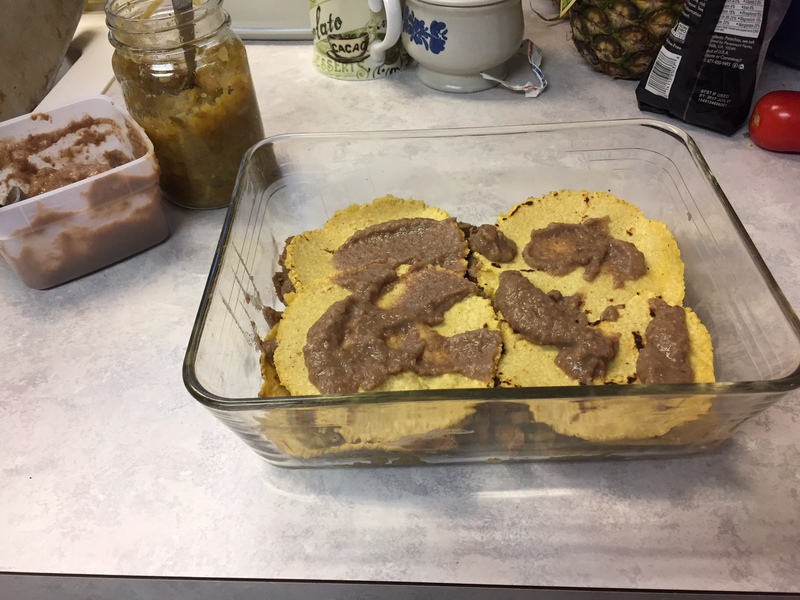 I did not end up using it all up over the summer, so when I found it again recently, I decided to target it in my meals. The first thing I did with it was use a couple of Tablespoons to thicken a beef stew. This was a stew that was made from beef, broth, canned tomatoes, onions, carrots, potatoes, beans and some herbs and spices, plus salt and pepper. When I finished, it was pretty runny. 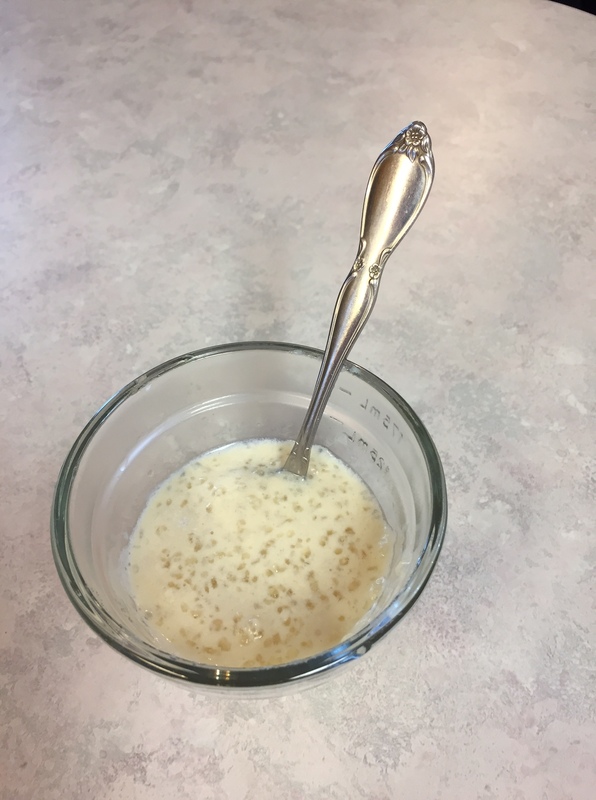 I just put in a little tapioca and it thickened up nicely. 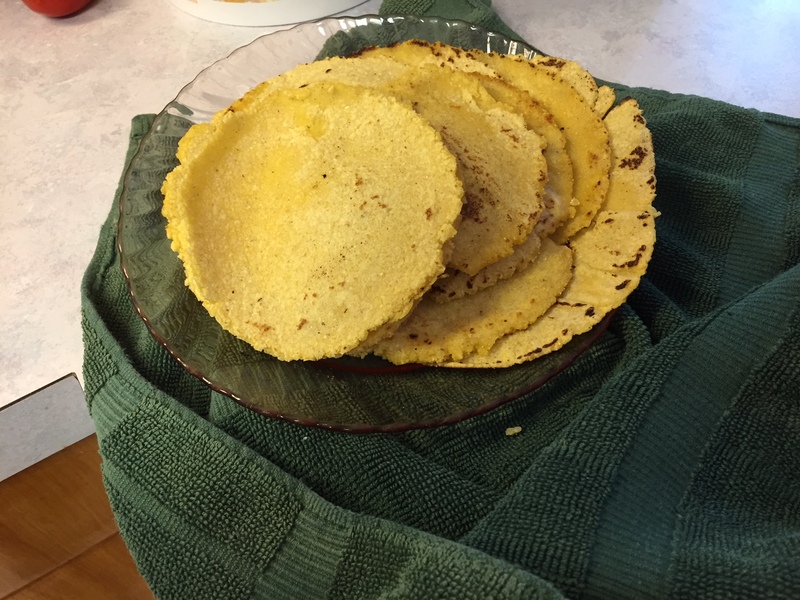 I am gluten-intolerant, so this made a nice substitute for wheat flour. The second thing I made was tapioca pudding. I got a recipe from the Kraft website. Mix milk, sugar, tapioca, salt and the beaten egg in a saucepan. Let sit for 5 minutes. Cook on medium (I did med-high and watched it very carefully), stirring the entire time, until mixture comes to a full boil. Remove from heat. Add vanilla and butter. Cool 20 minutes; stir. Serve warm or cold. Makes 6 servings. Store leftovers in fridge. 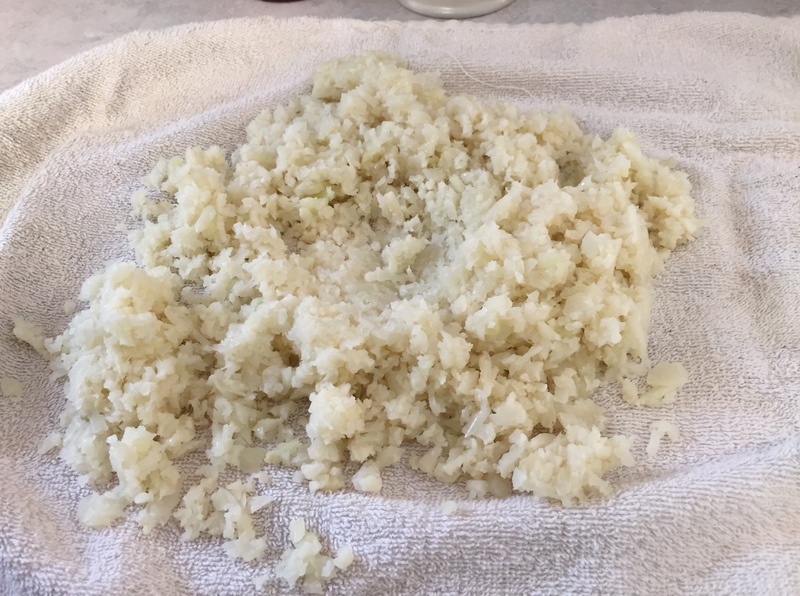 When I got done cooking the mixture, it was so runny I though I had made a mistake and had tapioca soup. The recipe says it thickens as it cools, but I thought there was no way this would become pudding. But, it really did. In fact, it turned out to be very thick once it was cold. So, I might actually use 3 cups milk next time. 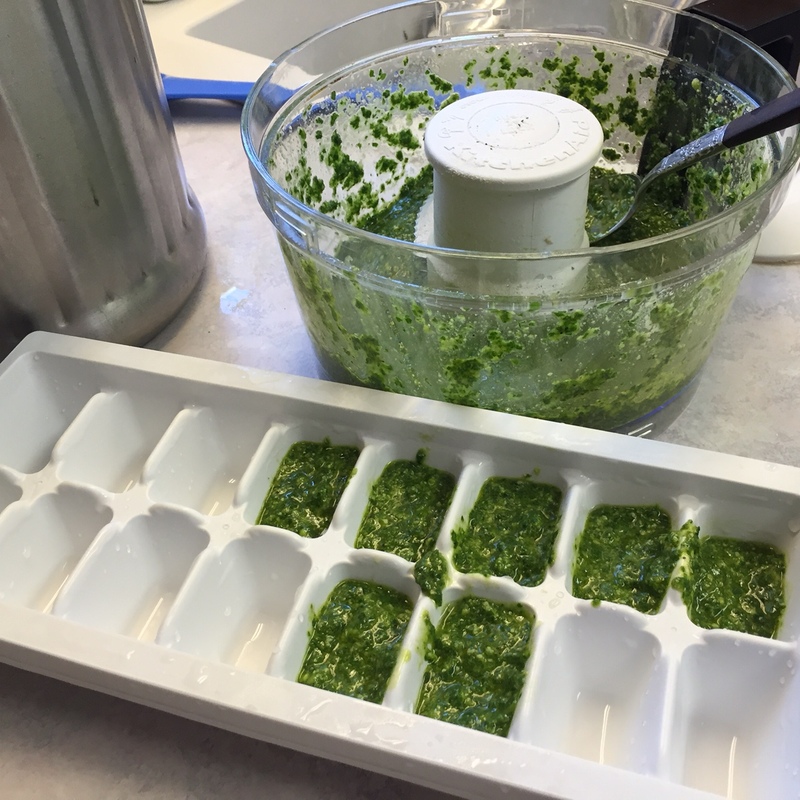 The other day, I made pesto from the last bits of basil in the garden. I do it a little differently than some others do. This recipe started from Taste of Home’s Basil Salmon Recipe, but I’ve changed it up quite a bit. For one thing, we don’t use pine nuts. We like more parmesan cheese. I’ve even tried cutting down the amount of oil used, but that one did not work. It takes it all. 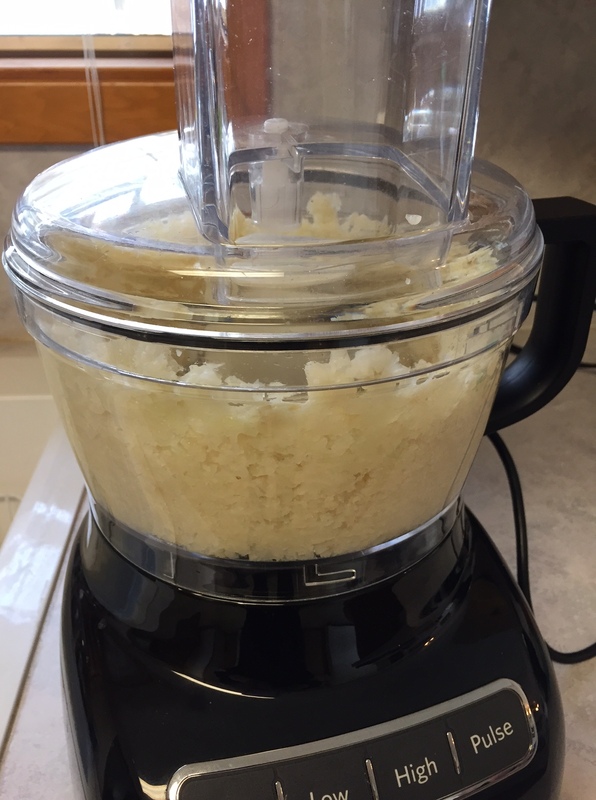 Place all ingredients in food processor. Pulse until it is all incorporated together. Taste. Add more salt, pepper, cheese, etc. that you want, to taste. Freeze in an ice cube tray. Once frozen, pop the frozen cubes into a zip-top bag and keep in freezer until ready to use. Makes 1 ice cube tray full. We use it on fish and chicken, in salad dressings and dips, and pasta the most. Ja’Ana and I love it! The camper fridge gets full extremely fast. Even so, I lose leftovers in there sometimes! 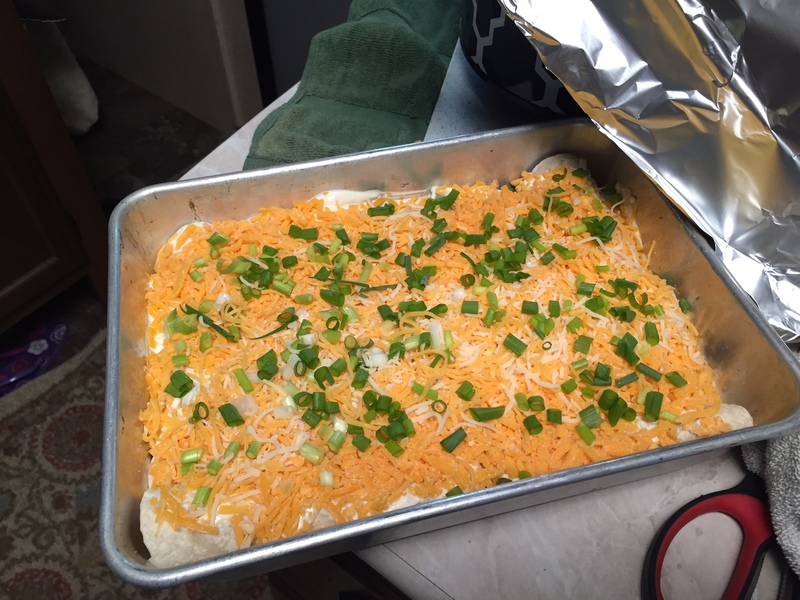 I don’t want to waste food, though, so today I searched out several bits and pieces and made enchiladas. I usually use a tomato base with my enchiladas, but today I was focused on using some things up. 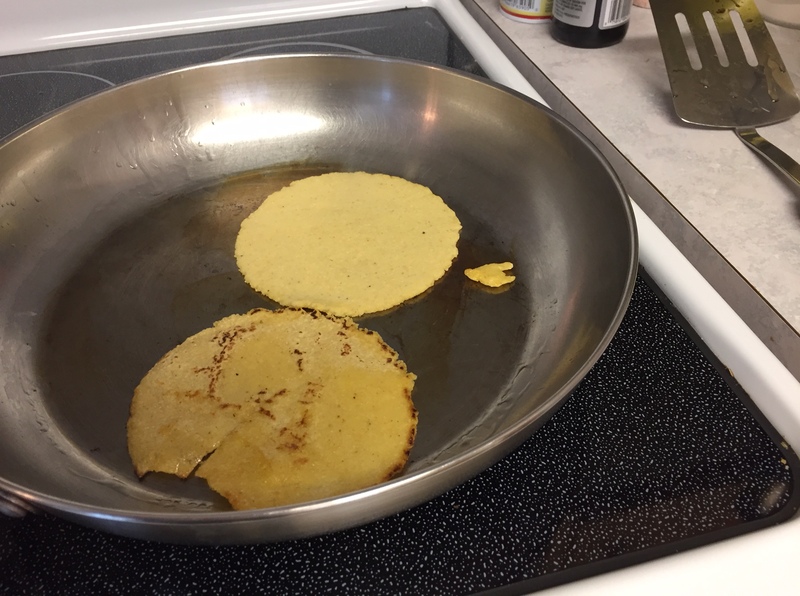 I put a little bit of each of these things into 10 warmed corn tortillas, rolled them up, and placed into a pan sprayed with non-stick spray. 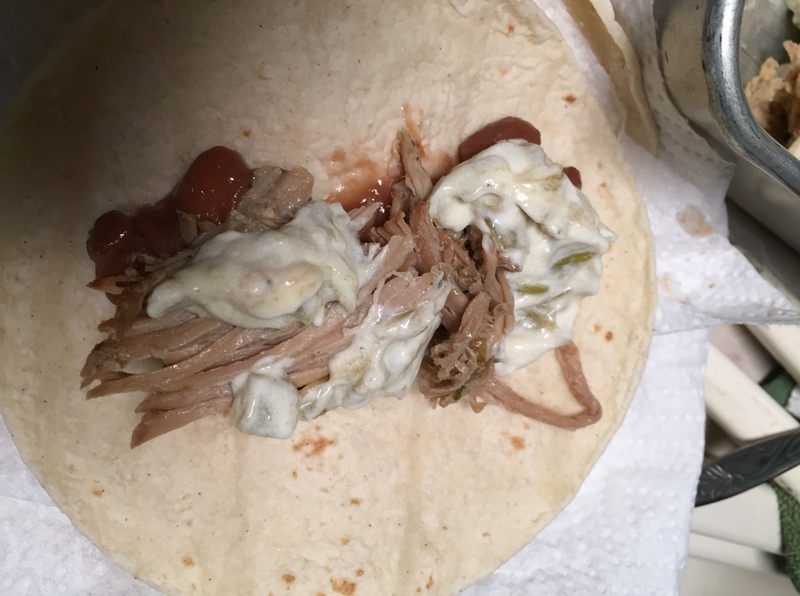 I made sure to finish off the pork, but have lots of beans left for another day. I covered with foil and baked in 350 degree oven for about 45 minutes-1 hour, until warmed through. It would be so easy to use chicken, hamburger, or whatever meat you have left over. Any cooked beans would work. There could be more cheese, or less cheese. Olives could be added on top, too. It is a great way to use lots of little bits of meat that are leftover. Everyone will feel as if they got a whole new meal. I’m sure looking forward to dinner tonight!